Our ice cream is unique, as it is the product of Guernsey milk exclusively. Guernsey milk is high in beta-carotene, a protein that gives milk its yellow-gold color. This milk is also higher in A2 proteins, which are recognized by physicians for unique health benefits that other proteins do not provide. When we make ice cream, we make it in small batches, in a processing room located just off the box stall barn. 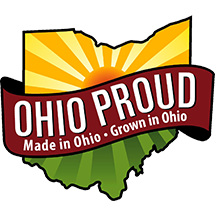 We are regularly inspected by the Ohio Department of Agriculture to make sure that the environment we make ice cream in is as clean possible to produce a safe product. The ice cream business started as a dream of Lucas, our youngest son, and we found much joy in pursuing the project. It has expanded the traditional way of marketing our milk. Lucas makes all the ice cream and delivers on Fridays, with flavor development help from Bonnie. Our flavors are available in over 30 stores locally. We also purchased an old mail truck that was converted into an ice cream truck, which we can use to travel to local farmers' markets and area businesses - sometimes with a cow and calf! - to meet face to face with consumers. If you would like to place an order or find a location near you, text or call us at 937-284-1358. We can arrange an on-farm pickup if that works for you! We are happy to produce a delicious, wholesome product for you to share with your family. You can share your stories by contacting us, or posting on our Facebook page! 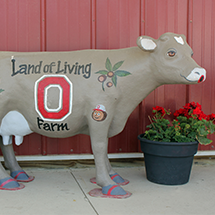 Each Ayars Family Farm Ice Cream flavor has a story – and many of those stories are those of our favorite Guernsey cows, who have left their mark on the farm and on our lives. Since we produce our ice cream on the farm, we know and love every cow whose cream goes into the container – in fact, every one of our cows has a name recorded on their registration paper (the bovine equivalent of a birth certificate). We are happy to share our stories with you! It’s easy to tell our vanilla ice cream apart from the others – the flecks really authenticate this creamy confection. It’s named after Genuine, a matriarch of our herd. Genuine has a long pedigree that has sent her to many states and shows, as far away as California! Lucas says Genuine is his very favorite cow – and she’s featured on our container! In both mild and strong flavors, our chocolate ice cream can be as rich as a truffle –its namesake, Chocolate, was part of the herd a few years back and had a personality every bit as rich as our ice cream! One of the first flavors we developed, this ice cream quickly became a ‘signature’ flavor of our early efforts. Quality is packed into each container – and our ‘signature’ assures it! Snickerdoodle is a cow with a spicy personality, just like the cookie! Often among the first in the barn to be milked, this cow is certainly a busybody. Quite simply, this is a unique flavor! Smooth and tart at the same time, as soon as it touches your taste buds, you’ll be a fan. 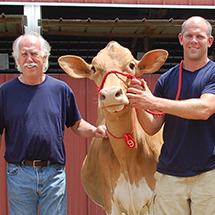 Raspberry the cow is remembered in the same way – the memory of her brings a smile to our faces. Caramel was nearly a solid golden color with just a touch of white. Just as her sweet personality mixed well with her herdmates and everyone who knew her, this flavor mixes well with many of our others. A favorite with our customers. We had a cow named Pecan who was on the farm at the same time as our Caramel – they mixed as well as these two flavors do! You’ve got to love this creamy indulgence, with just a touch of caramel! You can serve it up with chocolate to show your ‘Buckeye’ pride! Butter was a cow that we purchased from a herd in Wisconsin – she had two sets of twins during her time here, and you can only imagine how much fun we had naming her daughters. One of America’s most beloved flavors is made here at Ayars Family Farm – and ours is quite special, using Andes mints. While we’ve never given a cow this specific name, we have had cows named Mint, Chocolate, and Chip! One of our newest flavors, Wedding Cake has been a rather new tasty pleasure to try. While some similar flavors can be very sweet, ours is more refined, and the colorful sprinkles on top remind us that this flavor celebrates a very special day. In the barn, Wedding Lace is just over three years old, and she earned her name when she was born on the same day our middle son was married. Another recent addition, Banana is named after a unique cow on our farm. She was long-bodied, but not very tall - shaped like a banana! She was a cow with a sweet disposition and a gentle way. Our banana flavor is sweetened with brown sugar, honey and graham cracker crumbs. Our seasonal flavors are named for the holidays or times of years that we build memories around! Though we think of Pumpkin for the fall and Thanksgiving season, the term is appreciated year-round at our farm. It’s not uncommon for us to call our new golden calves ‘little pumpkins’! White Christmas was, of course, named for Irving Berlin’s famed song. White mint flavor is blended with white chocolate, and a few snowflakes peek through the lid. This is our favorite dessert at our holiday table! Our efforts to develop a flavor to mark a day dedicated to love led to our Sweetheart Swirl ice cream. Double chocolate hugged by raspberry is love at first bite!